You are right to be concerned! Bleeding gums are often the first sign of gingivitis, a medical condition that can lead to serious consequences, including tooth loss and gum surgery. There is advice elsewhere on this website regarding steps you should take in your overall oral care regimen to properly treat bleeding gums. The first and most important is to see your dental professional. The Natural Dentist Healthy Gums Mouth Rinse is an herbal/botanical remedy that was originally formulated by a practicing dentist to treat his own patients’ gum problems. His dissatisfaction with existing mouthwashes combined with his avocational interest in natural, herbal remedies (and lots of experimentation) led him to the formula that founded this company. The mouthwash contains a unique combination of medicinal herbs plus the time-tested therapeutic value of 20% purified Aloe vera. It has been clinically tested at NYU Dental School and proven effective in actual use among people suffering from bleeding gums. The Natural Dentist Healthy Gums Mouth Rinse comes in two pleasing natural flavors, developed with great taste in mind: Peppermint Twist and Orange Zest. 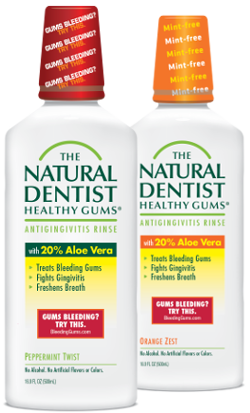 To find a store near you to purchase The Natural Dentist Healthy Gums Mouth Rinse, click here. *It is important to note that with proper treatment, bleeding gums can be completely reversed.